If you read Health, you probably know we love Greek yogurt. But now we have even more reasons to love it since Greek yogurt-maker, Chobani, Inc. is coming out with some new flavors and sizes, including kid-friendly "Champion Tubes," diet-friendly 100-calorie cup sizes called "Bites," and combo packages called "Flips," which include mix-ins that can be added into the yogurt. If you read Health, you probably know we love Greek yogurt. It's thick, creamy, and provides double the protein of regular yogurt. Plus, it goes great with fruity toppings. And it's great for healthy cooking. You can use Greek yogurt as a substitute for sour cream and mayo in recipes like this chicken souvlaki and low-fat banana bread. 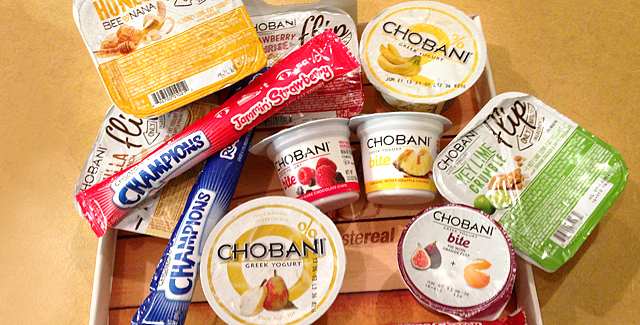 But now we have even more reasons to love it since Greek yogurt-maker, Chobani, Inc. is coming out with some new flavors and sizes, including kid-friendly "Champion Tubes," diet-friendly 100-calorie cup sizes called "Bites," and combo packages called "Flips," which include mix-ins that can be added into the yogurt. Our favorite new Chobani offering was the Key Lime Crumble Flip, which comes with graham cracker crumbles. Just add the graham cracker bits into the yogurt and yum! This flavor was light, tangy, and delicious, although there are other types including, Almond Coco Loco, Strawberry Sunrise, Vanilla Golden Crunch, Raspberry Choco Fix, and Honey Banana. We also tried some of the Champions Tubes, which come in Jammin' Strawberry, Rockin' Blueberry, Chillin' Cherry, and Swirlin' Strawberry Banana. While we thought the strawberry-banana flavor was the best, the tubes were a bit sweet, and probably will appeal most to children. When in need of a healthy breakfast or snack, Greek yogurt is a great option.